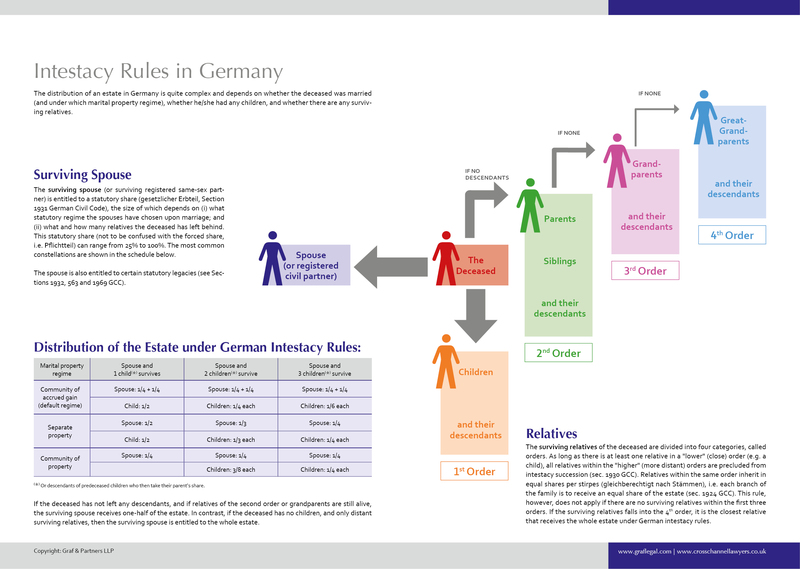 The German rules about what happens when a person dies without having made a valid will (intestacy), are set out in section 1923 to 1936 German Civil Code (Bürgerliches Gesetzbuch, an English translation being available here. Intestate succession affects many families because roughly two out of three Germans die without having a valid Will in place. German intestacy rules are very different from those in Common Law countries. Children of the deceased have a much stronger legal position in Germany compared to children under English or USA succession law, where the spouse usually receives more than the children. And there is the famous German “Pflichtteilsrecht” (“forced share” or “compulsory portion”), which appears a rather baffling concept to British or US-American succession lawyers, because it entitles one’s closest relatives to a share in the Estate (up to 50%) even if the testator cannot stand that person (for details see here). Who gets how much under German Intestacy Rules? Married couple with child/children: The general rule is that in most cases, half of the deceased’s estate goes to the surviving spouse, the other half goes to the child of the deceased (if more than one child, the children have to split this half share between themselves). This is, however, only true if the spouses live in the German default marital property regime (gesetzlicher Güterstand) which is the regime of Zugewinngemeinschaft (community of accrued gains), because the 1/2 share of the surviving spouse consists of two elements: (i) the inheritance share itself and (ii) a family law element, i.e. an allowance for accrued gains during marriage (pauschalierter Zugewinnausgleich). 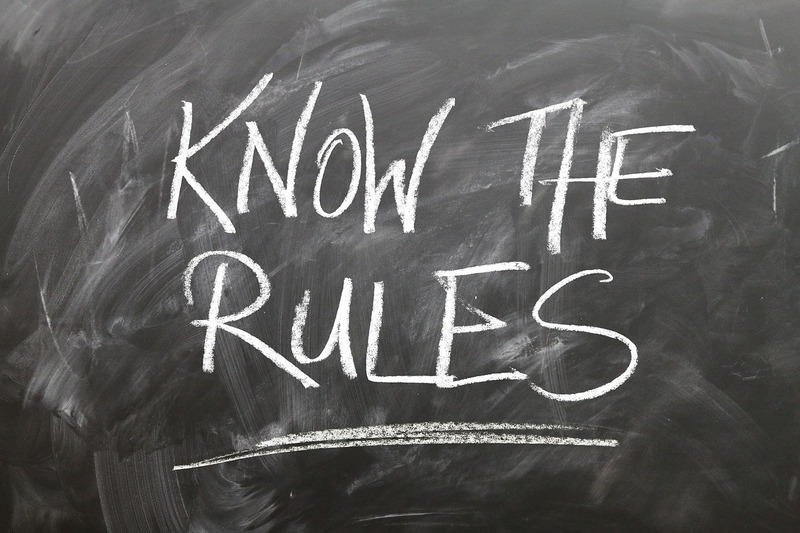 Thus, if the spouses have changed the German standard marital property regime, which is only possible by entering into a formal agreement recorded before a German notary, then the share of the surviving spouse can be different. Details are explained in the graphic chart above. Married couple and no children: Here, in most cases, the surviving spouse receives 3/4 of the deceased’s estate, the rest goes to the parents or (if they have predeceased) the sibling(s) of the deceased! This is a result, which the deceased in most cases would never have intended. Since this particular German intestacy rule is something which many couples are unaware of, this outcome leads to the most ugly disputes between the surviving spouse and the brothers or sisters of the deceased, who are now suddenly co-owners of the family property. Not married: Everything goes to the child (or children). If there are no children, then everything goes to the parents of the deceased. If they have already passed away: the siblings of the deceased. If the family situation is more complex, especially in patchwork constellations, the intestacy rules can lead to quite unfortunate results, especially since under German probate law there is no personal representative who is responsible for the administration of the estate and can take care of matters. Instead, all co-heirs (Miterben) must act together and are forced to agree about everything by unanimous vote (section 2032 German Civil Code). In other words: Even a co-heir who has only a minute share in the estate, can block the administration of the estate by constantly voting against the majority. In practice, this means that houses and stock can’t be sold, bank accounts can’t be closed, monies can’t be distributed until all (!) beneficiaries unanimously agree or until a German Court of Law has decided. Thus, contentious probate and disputes among co-heirs are rather common in Germany, because intestacy rules often create a community of heirs consisting of people who cannot stand or do not trust each other. 4th Order: great-grandparents of the deceased and their descendants. Each “Ordnung” precludes the following orders, i.e. as long as any relations of one of the prior orders can be located, all those of the next order are excluded from benefiting. Relatives within a particular category inherit in equal shares (succession per stirpes). Within a particular degree, an existing beneficiary excludes all his or her descendants from benefiting. Please note that the above percentages only apply if the spouses have not altered the German standard marital property regime (see in particular section 1371 German Civil Code). Also, and this is another big difference to the situation under English succession law, the spouse is not entitled to anything under German intestacy rules if at the time of the death of the deceased the requirements for the dissolution by divorce of the marriage were satisfied and the deceased had petitioned for or consented to the divorce (section 1933 German Civil Code). So there is no need for a final court order. Formally initiating divorce proceedings is enough to assure that the (soon to be ex-) spouse is no longer entitled to any statutory inheritance. In these posts, you can find more information on German Probate, German Inheritance Tax and Will Preparation. In case of contentious probate, disputes can be brought either before a German Probate Court (Nachlassgericht) or before the Civil High Court (Landgericht). More on civil litigation in Germany here and on the website of our litigation department (GP Chambers, German Barristers). The law firm Graf & Partners and its German-English litigation department GP Chambers was established in 2003 and has many years of experience with British-German and US-German probate matters. 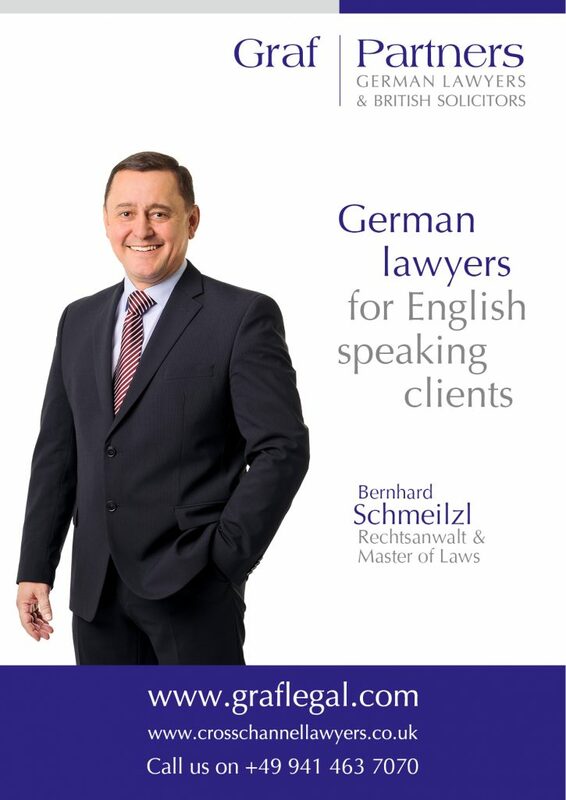 If you require advice or legal representation in a German or international inheritance case please contact German solicitor Bernhard Schmeilzl, LL.M. (Leicester) at +49 941 463 7070. Bernhard is also frequently asked by British and US Courts and Tribunals or by legal counsels to provide expert reports and legal opinions on German law, particularly German contentious probate matters and German inheritance tax issues.